Not a lot new to be said about James Berry Vineyard. Incredible farming, incredible fruit, and a talented, rock star owner who is certainly one of the most kind and humble people I have ever met. Picked September 27th, the fruit was fully destemmed and cold soaked for five days before inoculation with D254 yeast, one of our favorites for Syrah. After 21 days on the skins, it was pressed to all French oak, 40% new, as we felt the concentration and structure of this wine dictated a higher percentage of new oak. Bottled unfined and unfiltered. Dark black-purple. Almost Petite Sirah-like in color. An absolute drop-dead gorgeous nose of blackberry, mulberry, and white lilies. On the palate, so silky, so smooth. 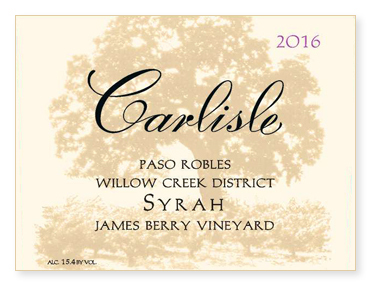 Flavors of blackberry and loamy earth give way to a long and moderately tannic finish. Already quite striking and enjoyable, give this bad boy a couple of years and then slurp from 2020 through 2031.